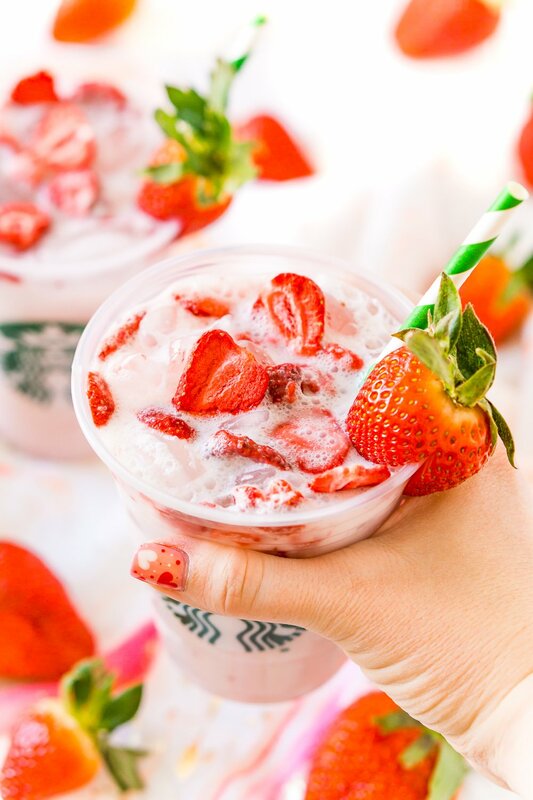 This Copycat Starbucks Pink Drink is a cheaper and just as delicious recipe to make your favorite fruity Starbucks beverage right at home with acai berry tea, coconut milk, white grape juice, simple syrup, and freeze-dried strawberries! Happy Valentine’s Day my friends! 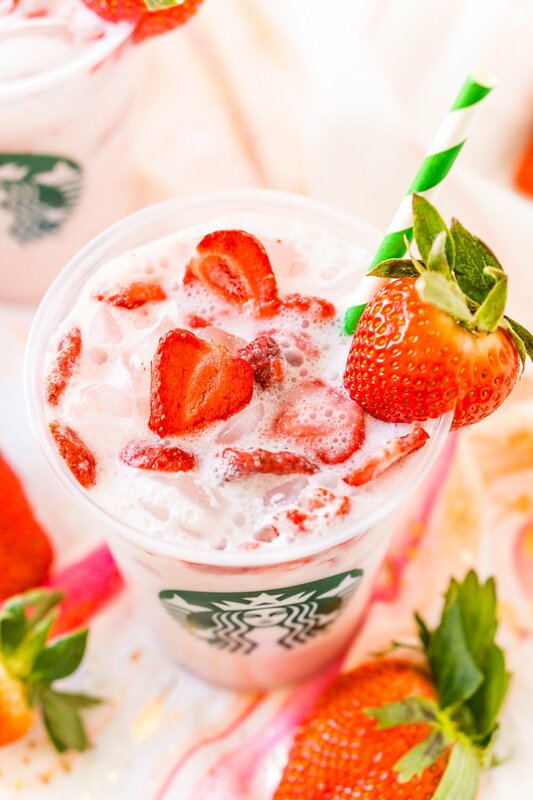 This Copycat Starbucks Pink Drink seemed like a fitting recipe to share with you today! After all, it is PINK! 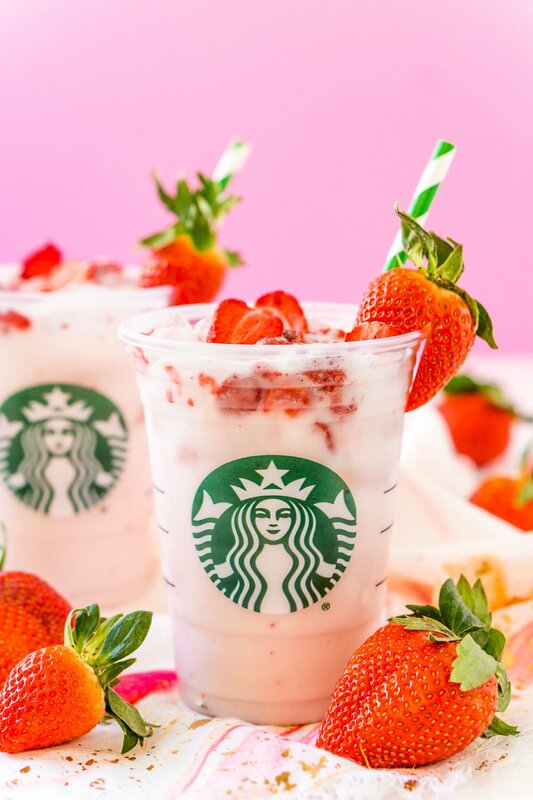 The Pink Drink was quite the social phenomenon a couple of summers ago and isn’t it crazy that people loved and requested it so much that Starbucks actually put it on the menu? That just goes to show the power behind social media, eh? This post is in no way sponsored, I just really LOVE this drink and I’m tired of spending $6 a pop on it so I set out to find a way to make it at home and figured I’d share the recipe with all of you too! During my pregnancy, I got a bit addicted to this fruity blush-colored concoction. Passion Tea Lemonade with a squirt of peppermint syrup has always been my go-to iced beverage at Starbucks. However, when I was pregnant I needed to avoid hibiscus and since I’m pumping I need to avoid peppermint, so the Pink Drink has continued to be a bit of an indulgence. Oh and the Pink Drink is super popular amongst breastfeeding mamas because the coconut milk is super hydrating and many think it really helps boost their supply. The Pink Drink Is Dairy-Free And Delicious! 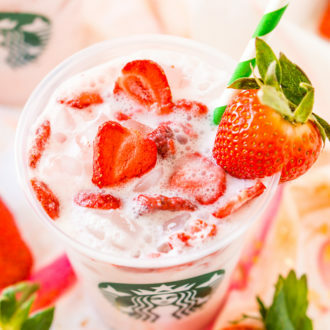 The actual Starbucks Pink Drink is made with their special concoction of green coffee and fruit juices. This is a copycat recipe that mimics the flavor made with easily accessible ingredients. 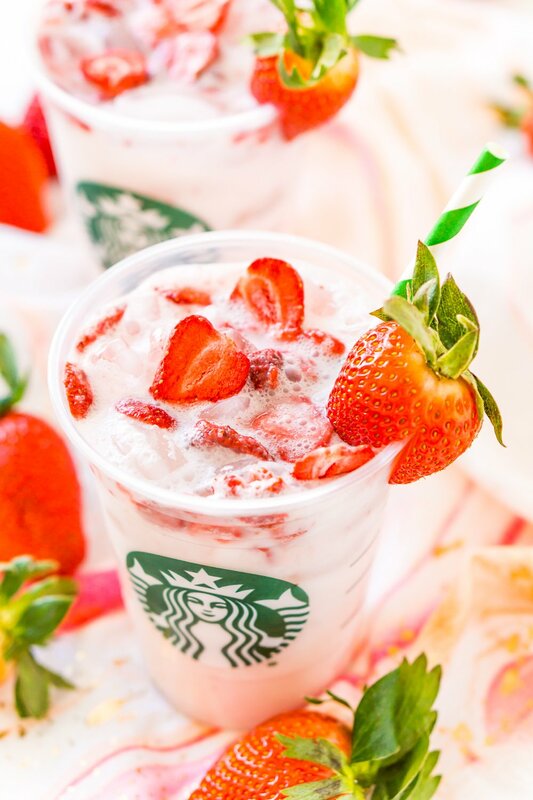 This recipe uses coconut milk, freeze-dried strawberries, and white grape juice which are actual ingredients in the Starbucks version. But the acai juice and green coffee are harder to come by so we’re going to substitute for a delicious acai berry tea. If you can’t find this tea in stores, you can buy it on Amazon, or you can use a raspberry green tea which will give you a similar flavor. I used to only be able to find freeze-dried fruit at Trader Joe’s but now you can buy it at Target and on Amazon too! What Ingredients Are In A Pink Drink? This is a really easy drink to make but it will take a bit of extra time because the tea needs to steep. If you plan on making a lot of pink drinks, I recommend making a large batch of tea and keeping it in the fridge to use as needed. Once you’ve made your tea, you’ll combine the tea, coconut milk, grape juice, simple syrup, ice, and freeze-dried strawberries in a cocktail shaker and shake. 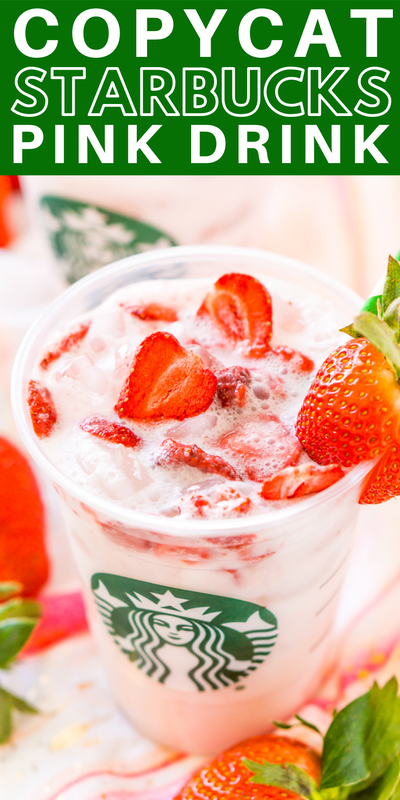 Pour into a large glass and enjoy right away! One thing to note about this is the calories. Generally, a grande (16 oz.) pink drink has 140 calories in it, but that’s because when you order it, you’re getting half ice. This recipe actually makes 16 ounces of liquid drink and the ice is added on top of it. The nutritional information also doesn’t include consuming the freeze-dried strawberries. Also, you can skip the simple syrup if you’re trying to cut down on sugar. Steep the tea in the boiling water and allow to cool. Once cooled, combine all ingredients in a cocktail shaker and shake. I like to slightly crush the strawberries when I add them to the shaker because the powder helps add more strawberry flavor. Pour the drink into a large glass and enjoy immediately. 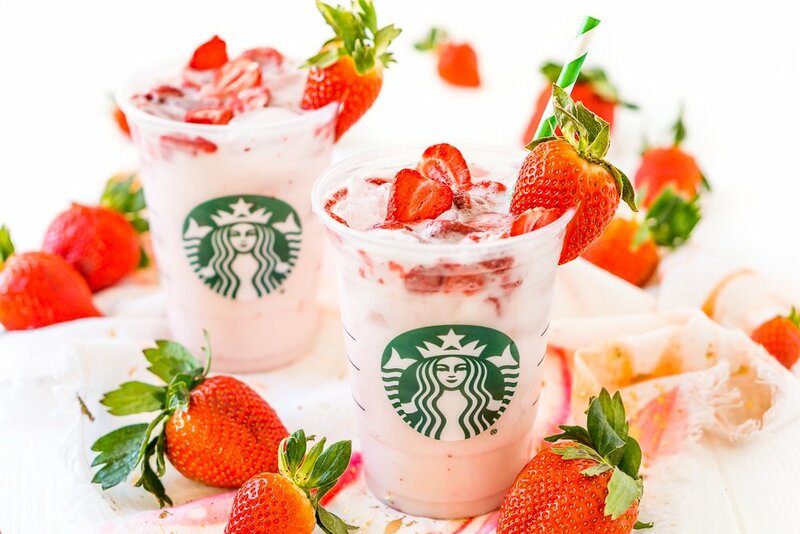 You could also use Starbucks VIA Berry Hibiscus Refresher mix instead of the tea. It's not the same as the Strawberry Acai but is a nice substitute. I definitely need to try this! Thanks for sharing!